Attending My 1st Conference and Stuff I’m Nervous/Excited About…. Next week, I will be attending my very first academic conference. Hooray! I’ll also experience another first: presenting my research for the very first time to people outside of my school. Sort of hooray! I’m a bit nervous about my ability to discuss my research eloquently (or at least coherently) to other conference attendees and presenters. I feel like I’ve been living with my research for awhile but under pressure I may come across completely lost and not very bright. After experiencing this while presenting and lecturing, I’m not looking forward to what may happen during a conference. 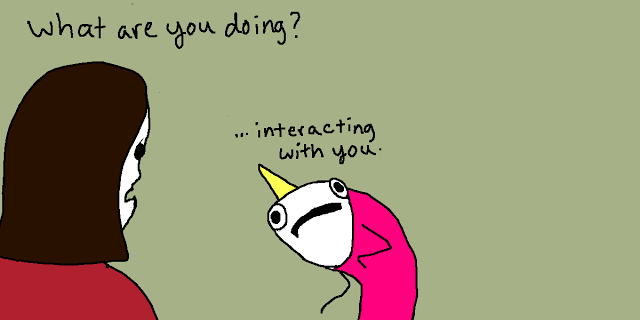 Another concern is that my introversion becomes a little more obvious in all-day social situations like conferences. For me, interacting with people takes a significant amount of energy, both mental and physical. But I’ve discovered that my field (and academia in general) is full of introverts who seem to have figured out how to play the socializing game. I can too! I will need to find an ideal balance between socializing time and alone time. Aside from this nervousness, I’m excited about meeting fellow researchers and hearing about what they’re working on. During the ALA Annual conference in July, I found myself inspired by the innovative programming, services, and tools librarians across the country have developed. I’m aware of what other doctoral students in my program are working on, but not much beyond that. At times, I become buried in my own research projects and those I’m collaborating on, completely forgetting the creative and intelligent research being produced by others in my field. I imagine I will find myself bouncing up and down in excitement and saying, “How cool!” a lot during the conference. This sounds professional, right?